The Helm SCM-EU is a combination high speed strain gage signal conditioner and sine-cosine resolver input module. 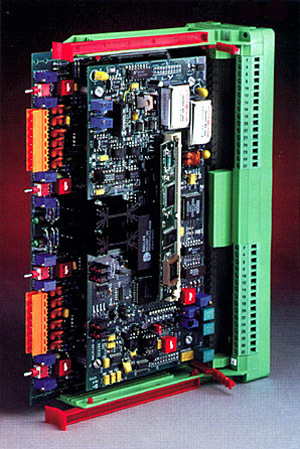 This universal module is best suited for applications where the monitoring of forces developed throughout the machine cycle is required. With high speed analog to digital sampling rate and resolver resolution of 0.1 degree, the SCM-EU provides high level signature analysis functionality. 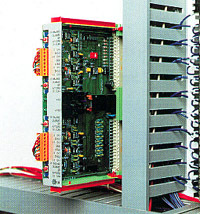 Available in one, two or four channels, the SCM-EU module is compatible with most PLC’s and operator interface displays. All necessary force measurement functions including signal conditioning, a regulated power supply and Helm’s patented AUTO-ZERO™ no drift balance circuits are included in the SCM-EU module. The module meets worldwide low voltage network standards for installation and performance. Helm HR-1101 Sine-cosine resolver interfaces with the SCM-EU module for thru the stroke monitoring. Press curve and delta track alarming techniques are also available. Helm manufactures a complete line of standard and custom load cells. Our transducer engineers are available to discuss your specific force measurement applications. Each module supplied with card cage assembly for backplate mounting. Includes screw terminals with user connections.